Accepta's high performance cooling tower water treatment chemicals protect cooling systems, maximise efficiency, reduce water consumption, save money and protect public health. To ensure such cooling towers are correctly maintained and operate at optimum efficiency it is essential that the correct cooling water conditions are established and then maintained at all times. This can be achieved using carefully selected cooling tower water treatment chemicals. Accepta’s comprehensive range of high performance cooling water treatment chemicals have been scientifically formulated to deliver significant operational benefits and performance improvements to cooling towers, and open and closed cooling systems that use water as a primary coolant. Our extensive range of formulated chemicals for cooling water treatment applications includes highly effective dispersants, corrosion inhibitors for both hard and soft water, and advanced multi-functional scale and corrosion inhibitor formulations. We also offer a full range of high performance oxidising and non-oxidising biocides for microbiological control activities in cooling towers and other cooling systems. Look out for the icon which denotes which products are available to order online today. To make ordering simpler Accepta now provide the option to purchase chemicals & water treatment supplies online with Card, BACS or Purchase Orders. Just look out for the trolly icon. If you are a water treatment specialist, FM or maintenance company who regularly resells water treatment products to your customers why not apply to become an Accepta Registered Reseller. Accepta’s range of advanced biocides and disinfectants have been developed for use in a wide range of commercial cleaning, disinfection, environmental hygiene, industrial and process water treatment activities including cooling system biocides where the effective control of microbiological activity in water and on surfaces is essential. Make-Up Water – Water added to the system to replace water lost through evaporation, bleed of and windage. Recirculation – The rate at which water circulates in the cooling tower (in m3/hour litres/sec). Bleed Off – Water deliberately bled from the system to prevent the cooling system water from becoming too concentrated. Maximum acceptable concentration factor – An expression of how concentrated the cooling water can become if problems with scale formation and corrosion are to be avoided. Windage – Water lost from the cooling tower through mechanical rather that evaporative losses. Temporary calcium hardness – The lower of either the calcium hardness or the Alkalinity (M). One tonne of refrigeration requires an evaporation rate of approximately 11.4L/hr. One KW of cooling requires an evaporation rate of approximately 1.5L/hr. Systems with water chloride concentration exceeding 200pppm if stainless steel is present. System water contains temporary hardness exceeding the limit specified by your treatment. The system concentration factor exceeds the recommended maximum. As a general rule concentration factors should not exceed 5 but where the product is primarily inhibiting corrosion then this should be reduced to 3.5-4.0 to ensure sufficient inhibitor is added to maintain corrosion inhibiting film. Accepta - The Water Treatment Products Company work with industry worldwide delivering practical, cost-effective solutions to resolve complex problems. If you require technical assistance or information about our water treatment chemicals and other speciality products, please contact our dedicated technical support team on: +44 (0) 161 877 2334 or complete our Technical Support form. Accepta offers custom chemical manufacturing, specialist toll blending and white label production services for our own water treatment chemicals and client specific formulations to British and international customers. To discover how you could benefit from our environmentally sensitive, quality driven chemical manufacturing capabilities please call us on: +44 (0) 161 877 2334 or contact us. Develop your skills with our industry-leading online training courses including Legionella & Asbestos awareness as well as COSHH and Manual Handling Courses. Accepta is managed by world leading industry experts who have designed training for engineers, facilities managers and environmental professionals. Keep up to date with our extensive library of good practice guides, latest research, regulatory updates, news and more... knowledge base. Accepta was established to provide high quality products that water treatment specialists can use to provide an equally high quality service to their own customer base. We are always looking to add to our growing number of locally based distributors working within the water treatment and related service sectors around the world. 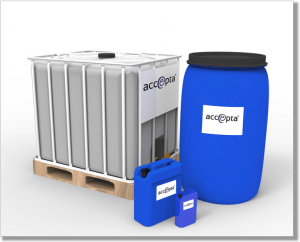 If you are interested in becoming an international distributor of Accepta - The Water Treatment Products Company please click here to learn more.